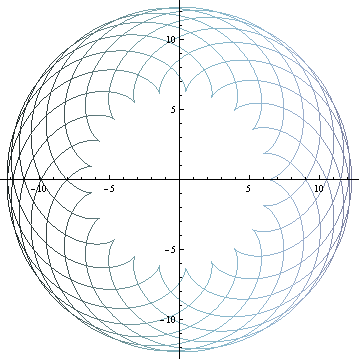 I am fairly new to Mathematica, and I cannot figure out how to plot an epicycloid. I have plotted some neat looking things in my attempts, but I still can't make one. I am not looking to make an animation; I just want the plot of an epicycloid. Would I use PolarPlot or ParametricPlot? How do I get a static picture of an epicycloid? It is easiest to use ParametricPlot and RotationTransform. Evaluated -> True is not strictly necessary; it's there just to construct the equation once instead of for every point in the graph separately (... which is slow). EDIT: Improved per comment from Mr.Wizard. 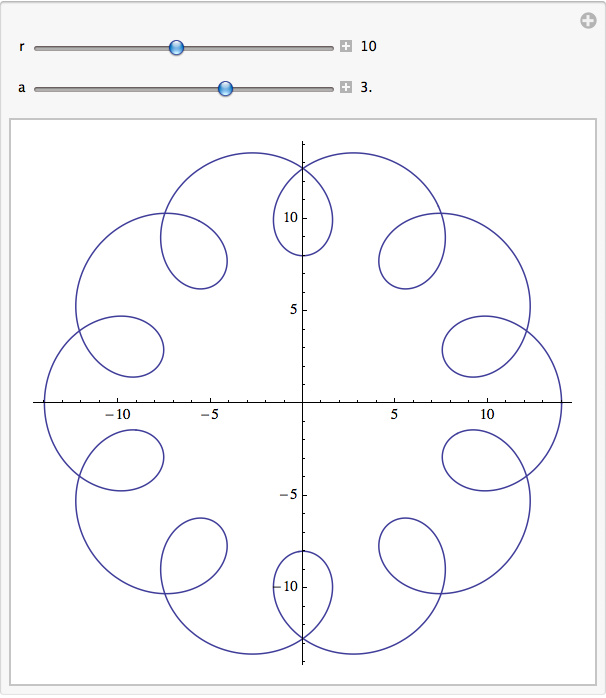 Epicycloids (and other roulette curves) are fun to play with using Manipulate. Here is one of many possible implementations. 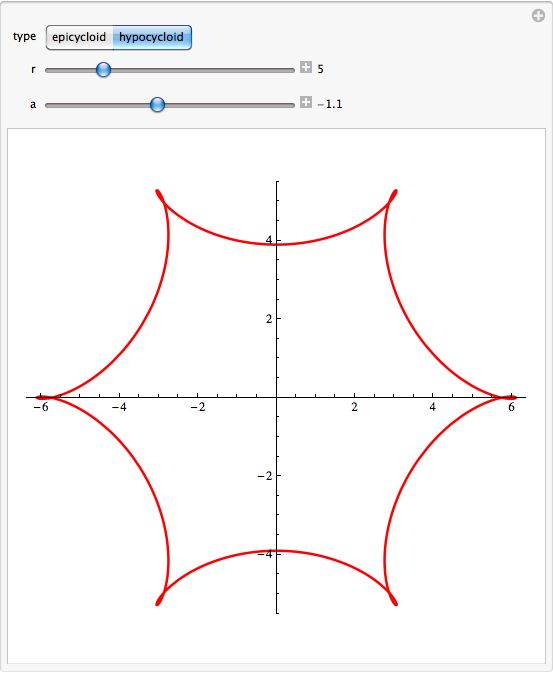 Although the question only calls for epicycloids, it is very easy to make interactive panel that allows the user to play with hypocycloids as well. 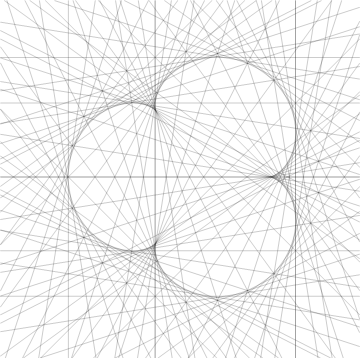 Because there is a simple relationship between epicycloids and hypocycloids, doing so adds very little code. 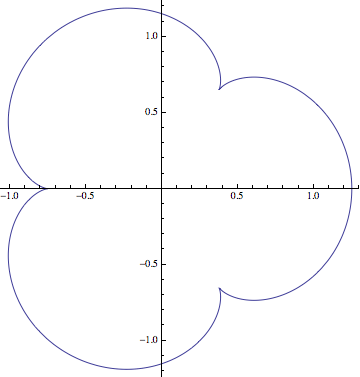 Looking up epicycloid we get the parametric equations describing it and then ParametricPlot does the rest of our work. Still another neat demonstration is the Bernoulli-Euler double generation theorem: an epicycloid is equivalent to a pericycloid (which can be thought of as the locus of a point mounted on a "hula hoop"). Not the answer you're looking for? Browse other questions tagged plotting geometry or ask your own question. How can I plot a Farey diagram? How to do make Plot automatically figure out a domain interval? How can I find the default PlotTheme, and default plotting colors, for the current StyleSheet? How can I make Plot or ListPlot scale the plot automatically for a given domain?